Delivering pure analog power in a unit weighing just over 1lb, the Vox MV50 combines classic amp design with new, innovative production techniques to deliver this miniature amplifier with a staggeringly good sound. Powering out an incredible 50 watts, this feather-weight package serves up serious tone that’s reminiscent of your favorite vintage tube amps. Complete with speaker and line/headphone outputs, the MV50 is perfect for the stage, studio or home. Getting such a good sound of the MV50 is thanks to the all-analog pre-amp circuit featuring Nutube, a revolutionary new vacuum tube that produces huge tube tone with a fraction of the footprint. By taking advantage of this incredible new tech, VOX’s engineers were able to push the limits on what can be achieved with such a small amplifier. The MV50 also comes with a large number of analog components that effectively reproduce the dynamic character of a traditional tube amp. In addition to the pre-amp circuit The MV50 also boasts an efficient Class D power amp that has been custom designed for the MV50. Though designed with the compact Vox BC108 enclosure in mind, the MV50 is a perfect match for nearly any speaker cabinet of a similar power handling capability. For when you do use the MV50 with a small cabinet, such as the BC108, setting the amplifier to 'Deep' mode will emphasize a rich low-frequency range and prevent the high frequencies from becoming too pronounced thus recreating extremely convincing big cab sound! When in use with a larger cab, simply set the MV50 to 'Flat' mode and you can take advantage of the units natural characteristics. The MV50’s line/headphone out can be directly to a mixer, audio interface, or your favorite pair of headphones so you can record or practice with serious studio sound anywhere or anytime. 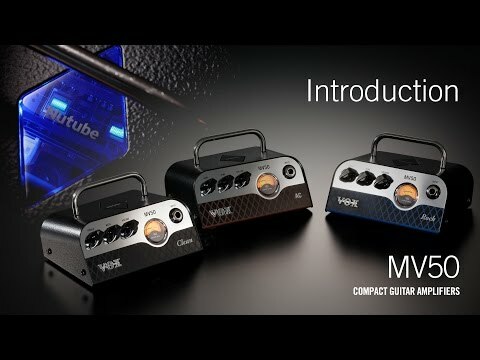 The Vox Nutube MV50 Rock Guitar Amplifier Head is a tiny amplifier with massive possibilities and will make you rethink what you though possible from such a small unit, experience it today.